Our homes in this category are larger homes with direct access to Lake Superior. All can accommodate above 8 guests. Most rates are based on minimum occupancy. An extra fee of $25/person per night may apply. Also, rates may vary between low, peak & holiday seasons. Your Exact quote will be determined by the number of guests & the property you choose when you finalize the booking process. Our Lake Superior access properties are located all around the Island. Access may be across a road; but, all have access to the lake. Please review the details of each property before booking. Most rates are based on minimum occupancy. An extra fee of $25/person per night may apply. Also, rates may vary between low, peak & holiday seasons. Your Exact quote will be determined by the number of guests & the property you choose when you finalize the booking process. Not only is Wisconsin a Pet Friendly State, Madeline Island is a Pet Friendly Vacation Destination. 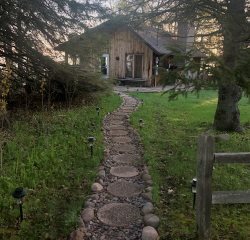 Madeline Island Vacations offers many Dog Friendly Accommodations!